When the list of names released from the Limerick panel before the start of the championship was confirmed earlier this year, Ronan Lynch's named jumped off the page. He has always been prodigiously talented and was one of the Treaty's most vaunted underage talents of recent years, winning a pair of All-Ireland U-21 titles. His senior club debut came when he was just 17 in an All-Ireland club semi-final where he was being marked by Ollie Canning. Lynch's Na Piarsaigh lost but Lynch made his mark, scoring three points including two sideline cuts. And even though his club's run meant manager John Kiely had little access to Lynch in the spring, it was still a surprise to most when he wasn't part of the 36-strong panel that would go on to make history. Looking back on it now, Lynch has made his peace with it all. "As much as there was a small percentage of me saying, 'I'd love to be there', there was another part of me that was very happy for them and proud to be a Limerick man seeing them go up and win an All-Ireland because that is what everyone has been hoping for for a long time. "Look, no one likes to be dropped off a panel. And in your own mind everyone thinks they could be in there and contributing but at the same time, looking back, John has gone on to win an All-Ireland with Limerick and John has done an awful lot of things really well this year. "And if I wasn't good enough to starting on the team and I didn't put myself in the position where John Kiely couldn't not start me on the team and then if you are dropped off the panel you can't have any complaints. "I don't harbour any bad feeling or I don't think he made the wrong decision or anything like that. Obviously you'd be stupid if you weren't disappointed to be cut off the panel but it's about how you react to that and learn from your time in there and how you bounce back and get better and that's my focus now." Perhaps part of his surprise omission stemmed from how quickly it all came to him in the early part of his career because when things went south and his form deserted him, he didn't have the tools to turn it around. "A small bit of my problem was being talented at underage, it came a little bit easy to me. Performing so well at minor and U-21 level, I found that when things started to go wrong then, or when I had a little bit of a dip in form, I found it hard. You're kind of thinking, 'Ah, it'll be grand, I'll come back again'. But when you realise the amount of work that has to go into it to get to a consistent level of performance. That reality can be hard. "That's what I'm trying to do now, just work as hard as I possibly can in every department, just to get up to that level. It was tough, it was very, very tough to deal with, mentally let's say, coming through and having a bit of a reputation around the place, people expecting you to do so well and to go straight into the senior team. "Then for things not to go right for you and suddenly not be going well and people then... with me, you can even see it in the club, people know the potential you have and they kind of get frustrated for you when things aren't going right for you. It can kind of have a bit of a snowball effect then. "For me, it was just disappointment and sadness that I wasn't reaching the expectations that people had of me and it's very hard to change that mentality around." There's joy back in his hurling now. Lynch spent the summer in San Francisco hurling with the Tipperary club. 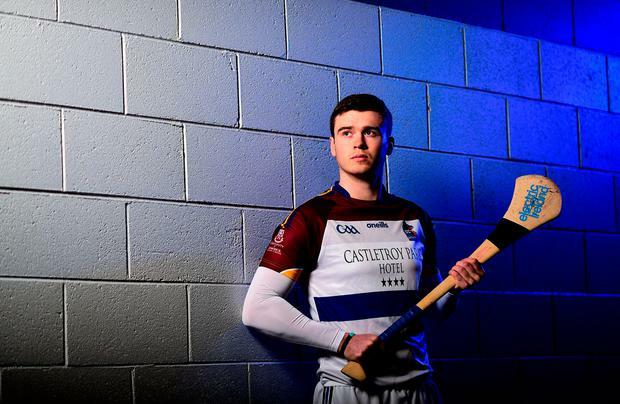 Na Piarsaigh aren't going all the way through to St Patrick's day this time around so UL, who have been drawn in the Fitzgibbon's 'Group of Death' along with UCD, NUIG and UCC, have his sole focus. And if the opportunity arises to go back to Limerick, he'll certainly consider it. "Whatever happens, happens. If your county manager calls you for anything, it's a huge honour. But I don't pick the team, I don't pick who is going in or who isn't, it's more trying to get myself in the best place possible and see where it goes. That's my goal t the moment, to get myself in a position to reach my potential."